Vascular ring occurs very early in the baby's development in the womb. 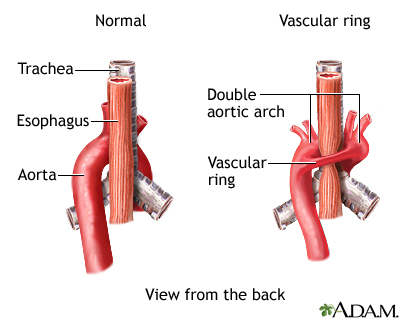 Normally, the aorta develops from one of several curved pieces of tissue (arches). The body breaks down some of the remaining arches, while others form into arteries. Some arteries that should break down do not, which forms a vascular ring. The health care provider will listen to the baby's breathing to rule out other breathing disorders such as asthma. Listening to the child's heart through a stethoscope can help identify murmurs and other heart problems. Surgery is usually performed as soon as possible on children with symptoms. The goal of surgery is to split the vascular ring and relieve pressure on the surrounding structures. The procedure is usually done through a small surgical cut in the left side of the chest between the ribs. Changing the child's diet may help relieve the digestive symptoms of vascular ring. The provider will prescribe medications (such as antibiotics) to treat any respiratory tract infections, if they occur. Children who do not have symptoms may not need treatment, but should be carefully watched to make sure the condition does not become worse. Delaying surgery in serious cases can lead to serious complications, such as damage to the trachea and death. Call your provider if your baby has symptoms of vascular ring. Getting diagnosed and treated quickly can prevent serious complications. Webb GD, Smallhorn JF, Therrien J, Redington AN. Congenital heart disease in the adult and pediatric patient. In: Zipes DP, Libby P, Bonow RO, Mann DL, Tomaselli GF, Braunwald E, eds. Braunwald’s Heart Disease: A Textbook of Cardiovascular Medicine. 11th ed. Philadelphia, PA: Elsevier; 2019:chap 75.